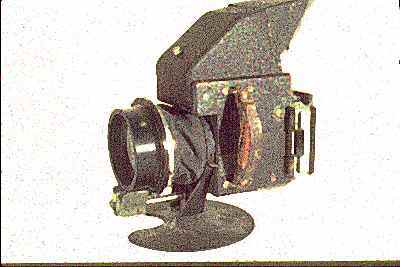 (Last Modified 26 Nov 99) A list of various cameras, made, exhibited, etc. The missing texts will go up later. The text is from various catalogs, and hopelessly out of date. I'll update whenever. I finally (1999) started to put some slide images up instead of line drawings. The red dots are up to date. This is not a catalogue raisonne. Cannot be exhibited under power, for the open wiring carries 450 volt. 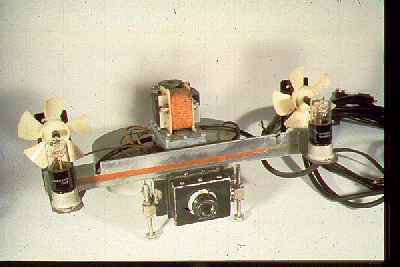 - January 1989: Randolph Street Gallery, Chicago, "Reclaiming Technology"
- March 1990: MIT List Visual Arts Center, "Radically Recycled Cameras"
- June 1996: Museum of Contemporary Art, "Art in Chicago 1945 -1995"
Follows, in order, the 8x10 and the 11x14 cameras. The body is a discarded process camera, found in a dumpster. I had a much smaller lens on this -- which wasn't very bright -- and then one of my colleagues gave me a 30" aerial telephoto lens. I immediately tested it to see if the front element could be removed, and if it would still function as a lens -- which it did. Thus I ended up with a shorter focus lens, and a larger aperture. The problem is that there is no film or filmholders made for 16x20. PICTURES: Took the first images (finally) in 1996, when it went for exhibition in Indiana. Had to build a film holder first. The final design involves the use of an aluminum picture frame, the frame of a window screen, and the use of two copper plated phenol boards (that is, large circuit boards). One phenol board was used as a blackslide (after being painted such), the other was used as a hinged plate on the back. Lith film was used, processed in Dektol 1:2. I used Katie Rodriquez (my TA) as my model, setting her in front of an offset press in the Generative Systems Workshop at Columbia. Even at f:11, and at a distance of six or seven feet, the depth of field was only a few inches. So her blouse buttons were in focus, but not her face. Katie made contact prints for the exhibition in Indiana, in Brown-print. I had an instructor (Alex Sweetman, who is now at U of C, Boulder) who was using a Widalux camera while I was taking courses from him at SAIC. 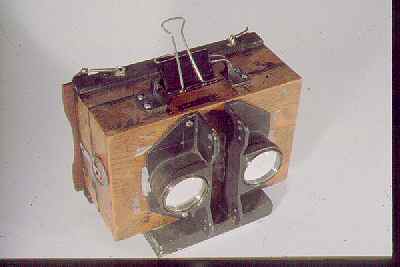 A neat camera (it is a 120 panoramic camera with a lens which scans to get the coverage). 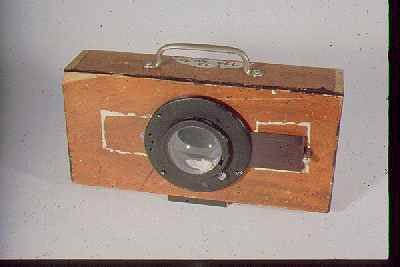 I couldn't afford a Widalux, so I built this Wide-Alex, as a 35mm pinhole camera with a carved out back -- so that the images are more than two frames wide. PICTURES: Got a few pictures, taken in the kitchen, and outdoors. Originally built in response to an RFP for materials design for a proposed FRA project which didn't get funded. The prime contractor was proposing to photograph the inside of railroad freight car wheels as they passed over the camera -- which would be mounted in the middle of a track somewhere. They wanted to test the notion that freight car wheels turn orange before they crack (many repair yards were removing wheels on this basis). A freight train may have 400 or 500 wheels on one side. 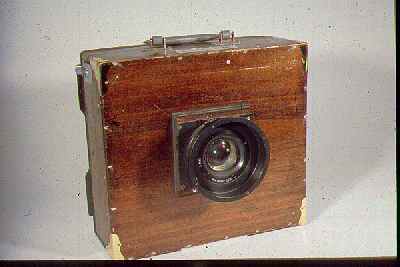 I built the camera, which holds 200 feet of film, and would thus be able to take 3200 (half frame) photographs. 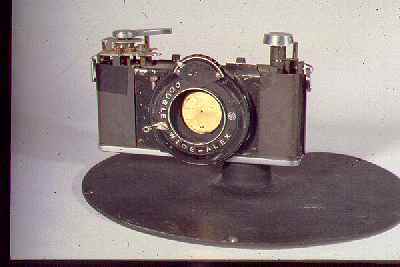 The problem was that there was no flash units available at the time which would take 400 repeating flash pictures at intervals of a 1/4 second. The flash equipment we needed was developed a few months after I completed this project, for computerized video inspection of an assembly line. So I also built a repeating flash, put together from an old HiFi amplifier, some light bulbs, and standard flash circuitry. PICTURES: Thus I have never used it (also because the camera doesn't have a shutter, for the wheel photographs were planned to be taken at night). But if I ever wanted to photograph the next 3200 people who showed up at my front door I would have the equipment to do so. EXHIBITION: Should be set up with its power supply (A black box with a meter, some outlets, and switches). 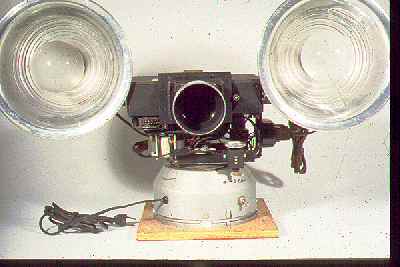 The spinning fans will not hurt anyone, for they can be stopped with a finger, and small control at the rear of the unit can be used to set off the flash and index the camera. Bought the camera body for $2.50, for it had been stepped on, and the plastic was cracked I still don't know if it works. Went to price a used lens, to find that the camera stores wanted $50 or more for them. Thus I mounted a door peephole (in a rubber stopper) with a small positive lens added to the rear. Very high fog level, but you can almost see around the back -- it covers nearly 180 degrees. PICTURES: I will probably get some film and a sample before the exhibition. While I was playing around with stereo images, I was also developing a course in experimental photography for Columbia College. Knowing the two-color processes were used in the 19th and early in the 20th century (for movies, even! ), I started to take two-color separations in stereo. I works somewhat, most of the time, and if the light is correct. PICTURES: Some red-and-green dyed stereo cards. They are difficult to view or make sense of, but you get the general idea if you see them. - December 1991: Gallery II, Chicago, "Amalgemations"
- March 1992: DiverseWorks, Houston TX "Continued Aesthetic Investigation"
"Wide Angle 35mm Strip Slow Projector"
Originally built to record the left and right edges of a locomotive simulator film, and intended for projection at the left and right edges of the same film to simulate peripheral vision. Later placed it on a revolving stand, and started making "films" with it. 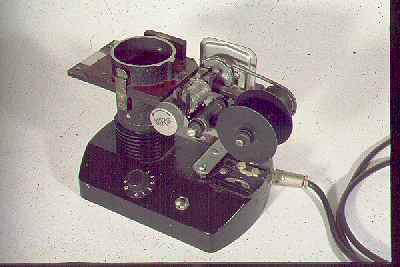 This is a slit-shutter camera, holds 100 feet of film, operated for about 20 minutes, and makes a negative 1 inch high and 100 feet long. The only requirement for a sensible image is that either the camera or the subject is moving. Have made "films" by rotation, and rotating during a dolly shot, including a window van. A film made with an Hungarian filmmaker during which we recorded simultaneously in rotation and translation have been shown in Germany as part of the European Media Arts Festival. 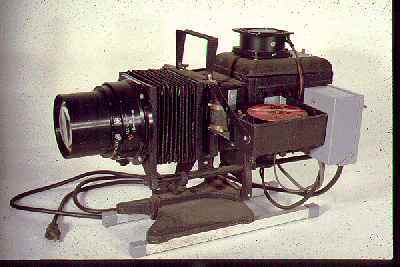 Four additional slit-shutter cameras have been made, one of which was used by the filmmaker Peter Thompson in the Yucatan, and used a tilting tripod head as the base, so the film simultaneously rotates and progressively tilts with each rotation (see slide 20). For the interior dolly shots I fabricated a cart from discarded lawn mower wheels and a large caster wheel found on the street one day. Power is supplied to the camera with many extension cords. Because the camera design includes an AC motor, to use it in a truck I had to design a 12 vdc to 120 vac converter (power supply, below). 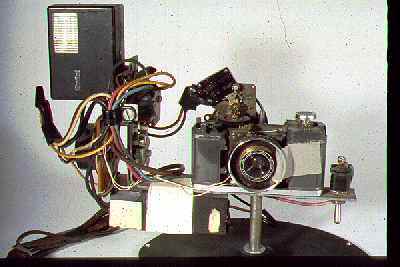 EXHIBITION: The camera could be exhibited on the tripod set up on the dolly base. I would certainly make more sense this way than just sitting on a wooden base. PICTURES: The most impressive work (other than the "films") are backlighted transparencies, mounted in a box with a flourescent tube behind the transparency. I have built three. The images are sections of film; thus one inch high and 2 or 4 feet long (see slides 25 and 26). One of the slides of the installation at List Visual Art Center includes the corner where one of these (a four foot long transparency) was mounted. I do not know if I sent that slide, or another. The piece at LVA was sold and is owned by Susan Dowling in Boston. PICTURES: A book of slightly enlarged prints in strips and blocks is owned by Olivia Gude, in Chicago. I have some 16x20 prints of sequences one or two days long, and there are some enlarged frames surrounded by contact frames as a border (Part of a series called "Living in Sin"). - October 1980: Columbia College Galleries, "Generative Systems Work"
- March 1981: Cameraworks Gallery, SF, "Generative Systems"
- September, 2000: COLUMBIA COLLEGE GALLERIES "First Works"
Made as a reaction to the design change in cameras about 15 years ago, when they went from chrome bodies to black plastic. It is comment also on the useless gadgets found on most cameras. 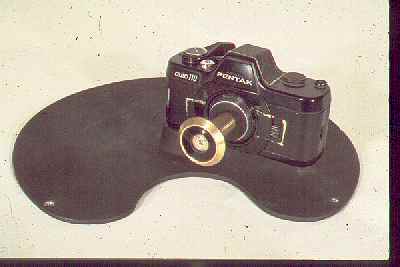 Never used this, for it is just not a good idea - 35mm pinhole images have terrible resolution, and it would be very inconvenient to have to process a single piece of film in an 8 oz tank (although perhaps the developer could be poured directly into the film canister). PICTURES: Thus: no images -- although I might make some just to see how it looks to have an image go across the sprocket holes. A student asked me about the design of a panoramic camera. I suggested a rotating cookie tin with a stationary coffee can inside as the film plane. 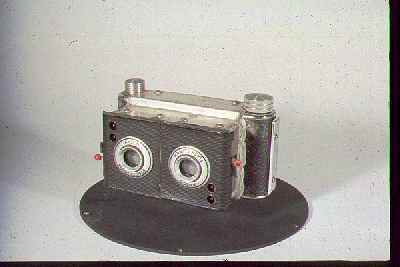 A roll of 120 film would unwind onto the coffee can as the outer tin rotated. When it got to the end of the roll the camera would jam, and picture taking would be done. By that time it would have done three circuits. I thought it was such a good idea that I built one. 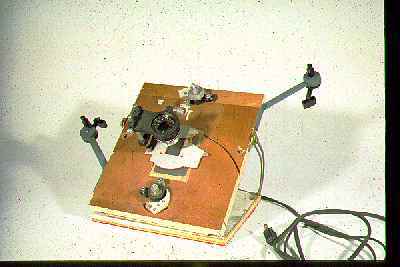 This camera will only make images if a very small slit is used, for the lens moves in translation rather than rotation (the turning point is too far from the rear nodal point of the lens). I have added a mirror in order to correct for this, and tested it. The camera is going out to an exhibition this week, but will be back in mid January. PICTURES: Will have some long pictures of circuits of the back yard (where else?). 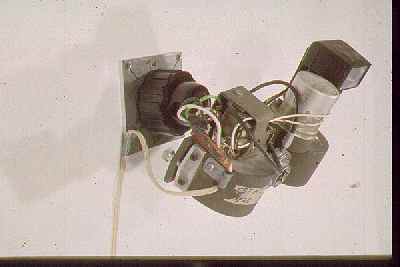 EXHIBITION: This camera operated from attached batteries, so that it can be turned on and off while on exhibition. - December 1991: Gallery II, Chicago, "Amalgamations"
- September 1994: RENAISSANCE SOCIETY, Chicago "After & Before"
I received an old Kodak 35mm camera from my mother-in-law, which had been used by her husband twenty years earlier, complete with the original box. 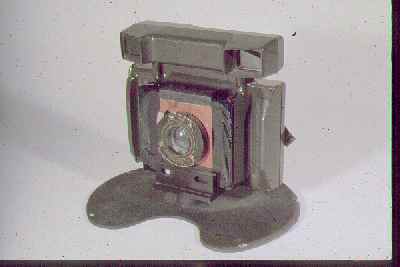 The camera was all gummed up from age, and I couldn't get it to work. But the box was useable. 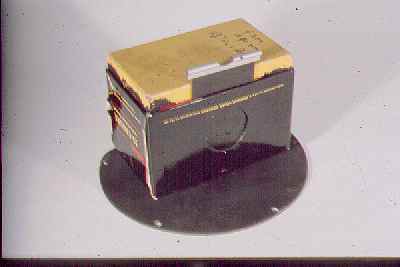 Like most Kodak packaging materials, it was covered in black paper on the inside -- perfect for a pinhole camera, and about the right size for respectable resolution. And I thought it would be appropriate. PICTURES: Some pictures. One of two small toy horses (made of hard rubber, and dating from the 40's) standing among giant blades of grass: see Technology Review. A check-cashing ID camera, received from a friend who didn't know what it was. It takes double frames on 16 mm film. When I saw it I knew immediately what I wanted it for: I added a lamp and a Mr. Coffee timer, and motorized the lever which took the single pictures to operate at a rate on one picture about every 3/4 second. It would thus wake me up and record my progress from bed to the Camera Alarm. PICTURES: None. Not only do I still have to collimate the lens, but I have to figure out some way of modifying a 16 mm film projector to operate at still-frame rates, and project two frames at a time. Oh well... ask me maybe I'll do it. I started out taking stereo photographs by simply moving a 2� camera sideways on a tripod. This often resulted in images which simply would not converge in a Holmes viewer. Later I built a wooden block shifting device (slide 14), but in both these cases I also ran into problems with ghost images of people and dogs. 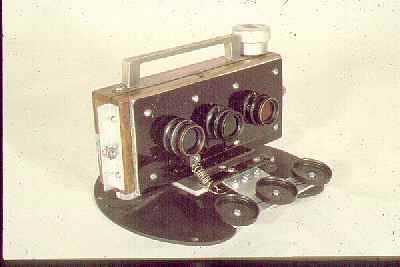 When I built a stereo camera the way they are supposed to be built (so \with both images taken at the same time, I realized that there might be something in leaving out the plenum between the two lenses, so that the two images would overlap on the film. To do this I needed a larger film than 2�, so the camera was built around a 5x7 film holder. PICTURES: There are a number of photographs, one is shown in Technology Review Magazine. 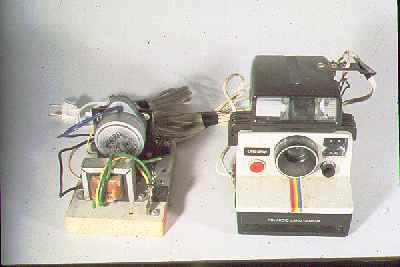 Have not completed this camera yet, although it should work in principle. This is the technicolor version of the two-color stereo camera, but it's not stereo, it just won't have a complete coincidence of the three images. This is also an outgrowth of studies in color separation (which I teach once in a while as a source for Gum-Bichromate printing). The shutter here is just three lens caps, since the required shutter speeds should be quite slow: to get the color separation negative densities to fall on the linear portion of the film curve, the film is first of all overexposed by 100 percent. Additionally, the filter factors are on the order of x6, and I would use very small f-stops since there is no control over focusing. PICTURES: I actually have time to try this out. It should work; maybe do some gum-bichromate prints.